As I opened my Friday session on Dive deep into Microsoft Exchange Server High Availability at Microsoft Ignite, I made mention of it being a session focused on on-premises Exchange. This was met with much applause from the attendees. This actually didn’t surprise me much, as the feedback from customers throughout the week had been their strong desire to see more on-premises sessions (especially for Exchange). During the panel session I participated in on Tuesday, I actually attempted to explain this trend from my perspective. I call these out not only for your viewing pleasure, but also to dissuade the idea that the Exchange Product Marketing team has forgotten on-premises Exchange. So back to my rambling. Throughout the week, myself and other speakers kept getting feedback that attendees wanted more on-premises content. Whether it was via verbal polls during sessions, audience feedback, or in the session evaluations, the message was clear. As someone who still spends the majority of his time working with on-premises customers, I could certainly understand their feedback. One interesting thing my colleagues and I noticed however was that the majority of attendee questions involved Hybrid or Office 365 in some way. I took this to mean most attendees were at least interested in “dipping their toes” in the cloud waters so to speak. While I understand the cloud isn’t for everyone, I find it hard to envision a world of the future where most customers don’t have at least some kind of cloud footprint. Not only is change a sensitive topic for some, nostalgia can trigger a very strong emotional response. The explanation I gave in the panel was that it likely feels as though the Exchange on-premises content has dropped off because we just rode a huge wave of Exchange innovation over the past 5-6 years. An extensive list, consisting of many game-changing features which drastically changed the way companies use email and how Exchange Professionals make a living. Before these changes, we were still deploying Exchange on expensive SANs, the only mailboxes in the “cloud” were via hosting companies, nobody cared who Edward Snowden was, and hosted email archiving was a pretty good business to be in. And to think, all this happened within ~6 years. It seemed every post on the Exchange Team Blog had some new drastic change that was altering the way we use email, usually for the better. At TechEd/MEC, you had to decide which Exchange session to skip because so many were available. This influx of new functionality not only changed the landscape of on-premises deployments, it enabled Office 365 to become what it is today. There’s no way Microsoft could offer reasonably priced high-performing 50 GB mailboxes in Office 365 if they still relied upon traditional backups and SAN storage using 15k disks. In my opinion, we’ve simply transitioned from on-premises innovations enabling Exchange Online to exist, to Office 365 gracing on-prem with its breakthroughs. 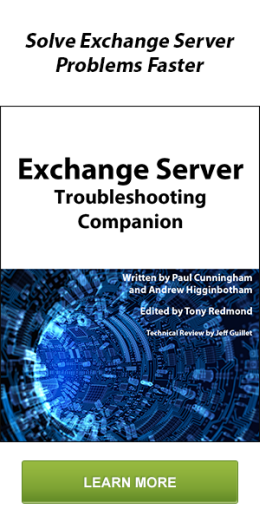 There simply aren’t enough new things to talk about in the on-premises Exchange world. Aside from all the new Hybrid goodness (much of which was brought to us by Tim Heeney at Microsoft Ignite), most new on-premises functionality have centered around High Availability (Replay Lag Manager/Read From Passive/Automatic Database Balancing/etc.). So maybe this post has been a long winded way of saying that Microsoft isn’t ignoring On-Premises, but rather that there’s less to talk about there. I don’t view it as them abandoning their customers, but focusing on where the educational needs are greatest due to rapid growth. Also, it’s hard to blame a publicly-traded company (who have a responsibility to their shareholders to make money) for focusing on what has been to date, one of the most profitable things they’ve ever done. I’m glad that you wrote this post. I attended Ignite and I have to admit that I walked away with the exact perspective that Microsoft was ignoring Exchange On-Prem. Perhaps Exchange has made such significant maturity recently, that the product has plateaued. However, I realize that my view was also influenced by the conference vendors. From my perspective it seemed that a vast majority where offering exclusively cloud or hybrid based products. My main take away from the whole experience is not that Exchange On-Prem is dead, but rather vendors are moving to the cloud architecture. If organizations believe they can stay exclusively on-premis, then they will see a reduction in solutions that will support the configuration. Personally, I feel that most corporations need to firm-up a Cloud strategy within the next 5 years. I don’t personally think MS is ignoring on-prem, as I mentioned, there were several on-prem Exchange sessions. I just feel that there is less there to talk about because the innovation is happening in the cloud because that’s where the majority of the profit is for Microsoft. I absolutely agree that there is a better profit margin with the Cloud for Microsoft. Also I really enjoyed the “Meet twin sons of different mothers – Exchange Engineers and Exchange MVPs” session.